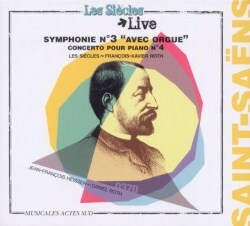 I’ve enjoyed several discs by Les Siècles and François-Xavier Roth, including a mixed programme of Spanish-themed music by French composers (review), their coupling of Le Sacre du Printemps and Petrouchka (review) and a recording of L’Oiseau de feu (ASM 06), which we don’t seem to have reviewed. Those stimulating releases spurred me on to get hold of a couple of their earlier CDs, of which this Saint-Saëns coupling is one. The performance of the Third Symphony was given at the Parisian church of Saint-Sulpice. Widor and Dupré were successively the titular organists of this church, serving the church for a century between 1870 and 1971 Since 1985 the post has been held by Daniel Roth, the father of François-Xavier Roth. For that reason and since the church possesses an 1862 Cavaillé-Coll organ I guess that the choice of venue was self-selecting. There is a photograph of this particular performance on the website devoted to this organ, where a full specification of the instrument may also be found. The organ is a mighty beast and makes a tremendous contribution to the finale in particular. However, the trade-off is that the acoustic of the church is very reverberant, which raises one or two issues. There’s much to enjoy in this account of the symphony, both in terms of the performance itself and also the way in which the music is performed. By that latter comment I mean that the timbre of the period instruments used by Les Siècles brings a lightness and piquancy to the sound which is refreshing, though the sound of the instruments will be heard to much better advantage in the concerto; during the symphony the acoustic often takes the edge off their sound. The first movement is lively and when the Poco adagio begins the strings sing the grave melody beautifully with a lovely soft and sweet sound from the organ as it underpins their melody. The repetition of the theme by wind and brass is similarly delectable. This performance of the slow movement isn’t as plush as one has heard from many modern orchestras, most of which field a larger string choir, but it’s still very pleasing indeed. There’s good energy in the scherzo and I like the way that Roth and his players handle the transition to the finale, generating a real sense of mystery. And then Roth père and the mighty Cavaillé-Coll organ are well and truly with us. To be honest, the three huge organ chords at the opening of the finale are completely out of scale with the orchestra and when the organ leads the reprise of the big tune it completely dominates. However, in between, when the tune is stated quietly for the first time, I absolutely love the way Daniel Roth voices the soft organ chords that punctuate the tune. It’s in this movement where the reverberant acoustic becomes too much of a good thing. Hitherto on several occasions it has muddied the sound of the timpani and brass when playing loudly but in the finale the recorded sound becomes really quite mushy more than once when the ensemble is playing at full tilt. In summary I’d have to say that this recorded performance does not supersede several fine modern versions, amongst which I’d particularly commend those conducted by Charles Munch - even if it’s not in its hybrid SACD reincarnation which I’ve never heard (review) – or the DG version led by James Levine. (I have yet to catch up with the performance conducted by Yannick Nézet-Séguin (review).) However, this performance by the Roths, père et fils, is well worth investigating as a complementary version. The other work on the disc is the Fourth Piano Concerto. This was recorded at two separate concert venues though I must admit I couldn’t spot the editing together. One of the two venues was a church but even so there’s none of the untamed resonance that affects the recording of the symphony. Here the instruments of Les Siècles are heard to much better advantage. In fact the constant ear-tickling that the period instruments provide during this performance is a source of delight. I only wish I could be as positive about the solo instrument. Jean-François Heisser plays on an 1874 Erard instrument, which is especially appropriate given that the concerto was composed only one year after this piano had been manufactured. Sadly, however, to my ears the tone of the instrument is shallow and unappealing. Heisser is an accomplished pianist though he’s not the equal of Stephen Hough on his widely-acclaimed set of all the concertos (Hyperion CDA67331/2). More to the point, I’m sure that the greater variety of tone and colour that Hough can draw from his piano and the more responsive nature of the instrument allow him to be more expressive and inventive than Heisser can be. In this performance I liked the way that the scherzo-like start of the second movement dances along and I also appreciated the vivacious performance of the concluding Allegro that we get from Heisser and Roth. However, there’s more fun and fantasy to be gained from Hough and Sakari Oramo. Once again, however, the intriguing sounds of the period instruments make this a fascinating way to complement a modern recording such as Hough’s and other listeners may respond more positively to the sound of the Erard than I do. Incidentally, on this recording the three sections of the third movement are individually tracked though, oddly, the Andante second half of the first movement is not. The documentation accompanying this disc is, frankly, lamentable. There are brief biographical notes in French and English about the conductor, soloists and orchestra but not a word is said about the music or about the style in which it’s performed. Given that the whole point of this disc is to present well-known works in a fresh light that’s completely unacceptable. To make matters worse some pages of the “notes” have been printed in different colours making them difficult to decipher. For the documentation this release receives a resounding nul points from me. That said, the performances are what count. Though there are drawbacks to both they do show two major works by Saint-Saëns in a fresh new light and for that reason they are well worth hearing.